Yesterday, SimpleTuition, a site designed to help students find an ideal student loan, debuted SmarterBank, a student-friendly online bank account that’s powered by The Bancorp Bank. SmarterBank, which offers a free checking account that features online banking, bill pay, and a Visa debit card, is designed to help account holders pay back their student loans. It does this by enabling users to set up payments (one-time or recurring) that feed directly to their student loans. It also features a friends and family contribution function that directly pays down the loan with micropayments. 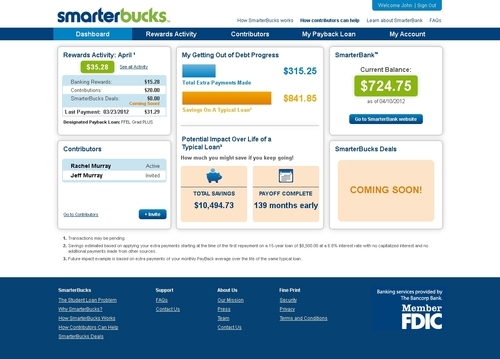 Another student-friendly aspect of SmarterBank is SmarterBucks, its free rewards program. Through a partnership with merchant rewards program, RewardsNOW, SmarterBucks enables users to accumulate rewards on everyday purchases that are automatically used to make extra payments on their students loans. This summer, it plans to offer special rewards targeted toward students. A linked savings account is currently in development and is slated for later this year. To learn more about SimpleTuition, watch its FinovateStartup 2008 demo. SimpleTuition’s PayBackSmarter.com now used by over 40 colleges & universities. Meniga’s PFM goes live within Skandibanken’s online bank in Norway. Mobile Enterprise Strategies interviews Kony’s VP of Mobile Strategies, Sam Lakkundi. Super Sprowtz to implement Virtual Piggy’s child-safe e-commerce tool. Swipely launches Main Street Marketing Manager. Seeking Alpha passes 1 million members, doubles its size in less than 2 years. ThreatMetrix lands $18 million in Series D funding. 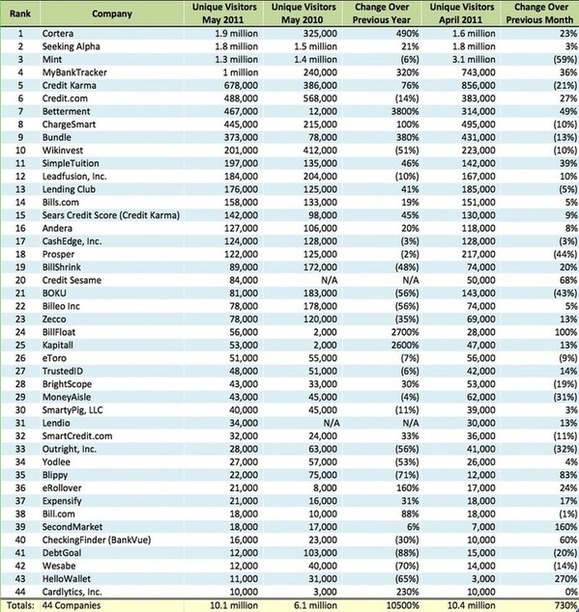 Forbes lists Expensify as 1 of 8 tools the iPad can help consumers earn & save money. Actiance to power The Principal Financial Group’s social media monitoring platform. Striata helps City of Tallahassee Utilities achieve 30% paperless adoption. SimpleTuition launches PayBackSmarter.com to help graduates manage student loan repayment. iPay Technologies announces Community Choice CU selects its Biz 2.0 small business online bill pay platform. US Bank hints at a partnership with FreeMonee. SimpleTuition wins the BostInno Insider Award for best higher education blog in Boston. TechCrunch reports TradeShift launches instant payment solution. Boston Business Journal covers Cartera Commerce card-linked offers. Cartera Commerce Card-Linked advertising network generates over $1 bil in merchant sales in 2011, more than previous 4 years combined. Mint.com launches new blog about style. InvestorBee launches Compare Investments tool. BOKU works with MasterCard to launch mobile payment platform. Out of 268 alumni, 75 had more than 10,000 unique U.S. visitors in August 2011 and are included in the tables below. Of those, 41 (55%) had more visitors in August than July. Year-over-year, 45 (60%) had traffic increases. Seeking Alpha — the most-trafficked in August with 2.5 million unique visitors — also had the highest increase in number of unique month-over-month visits with 300,000 more visits in August than in July. Budgettracker.com saw the highest monthly growth percentage with more than 6.5 times the number of unique visitors in August compared to July. Betterment had the highest percentage growth year-over-year, up 88x. Cortera had the highest number of unique year-over-year visitors, growing by 1.5 million. Fiserv had the highest month-over-month percent growth, with 50% more visitors. CheckFree had the highest percentage growth year-over-year, with over 5 times the number of visitors. S1 also had a high percentage growth year-over-year, doubling its visitors. 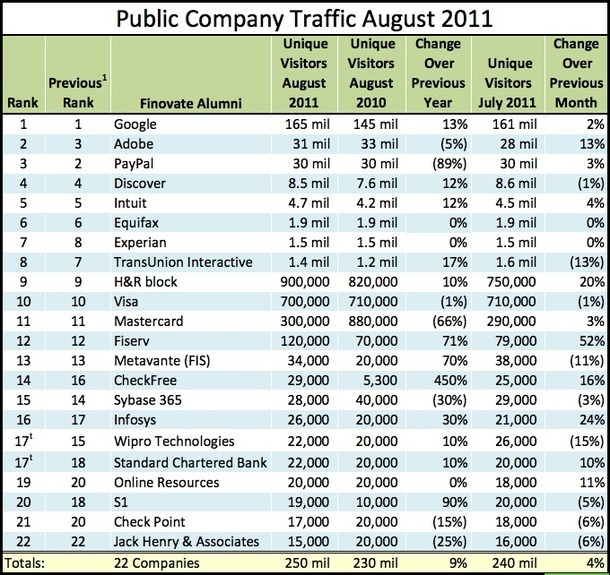 Out of 255 alumni, 59 (23%) had more than 10,000 unique U.S. visitors in July 2011 (see tables below). Of those, 19 (32%) had more visitors than in the previous month and 25 (42%) were flat. Year-over-year, 26 (44%) had an increase, 10 (17%) were flat, and 23 (39%) were down. Seeking Alpha had the most traffic in July with more than 2 million unique visitors. eToro saw the highest monthly growth percentage with 3 times the number of unique visitors in July compared to June. Bundle had the highest increase in number of unique month-over-month visits, with 450,000 more visitors in July than in June. eRollover had the highest percent year-over-year traffic increase, with 260,000 more visitors from last July. 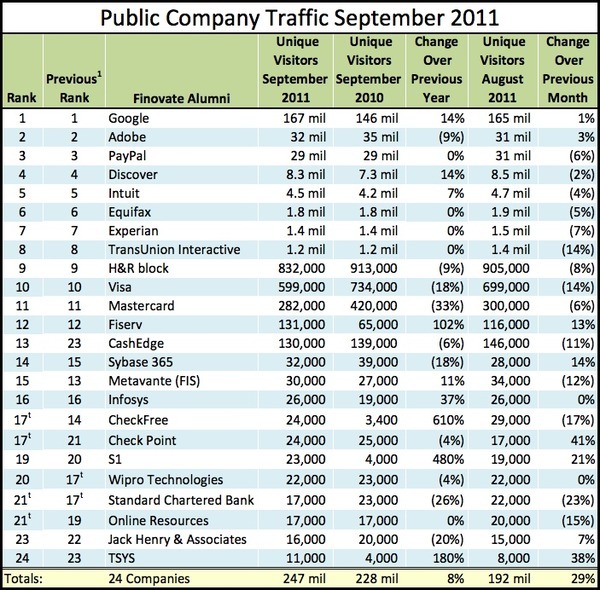 PayPal had the highest number of U.S. visitors in July, with more than 30 million visitors. Jack Henry & Associates saw the highest monthly growth with twice as many visitors in July than June. Wipro Technologies had the highest year-over-year growth, with 3 times as many visitors this year compared to last year. FIS Global and Online Resources also doubled their traffic compared to last year. 1. The previous month recorded was May 2011. 1. 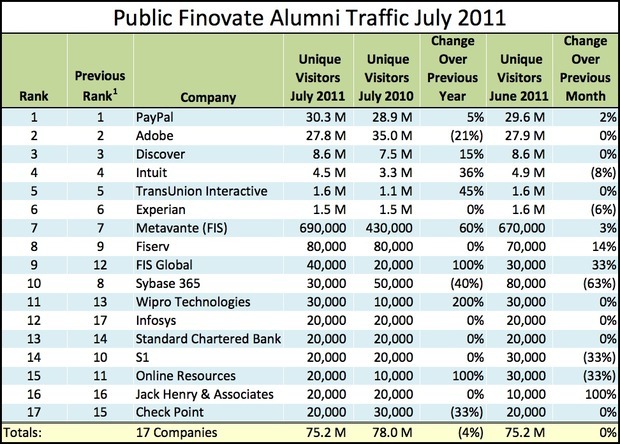 We reviewed 255 Finovate alumni. Only those with at least 10,000 unique visitors in July are listed. 4. Compete estimates online visitors based on the activity of a panel of more than 2 million U.S. Internet users. It is only an estimate of traffic and may undercount at-work usage. Each month we survey the Web-traffic performance of our alums, using data from Web-analytics company Compete to review the sites they operate. Out of 255 alumni, 62 (24%) had more than 10,000 unique U.S. visitors in May 2011 (see tables below). Of the 62 reviewed, 25 (40%) had fewer visitors than in the previous month and 28 (45%) saw a decline year-over-year. Cortera saw the highest number of unique U.S. visitors in May, with almost 2 million hits. HelloWallet experienced the greatest month-over-month growth, with more than four times as many visitors. 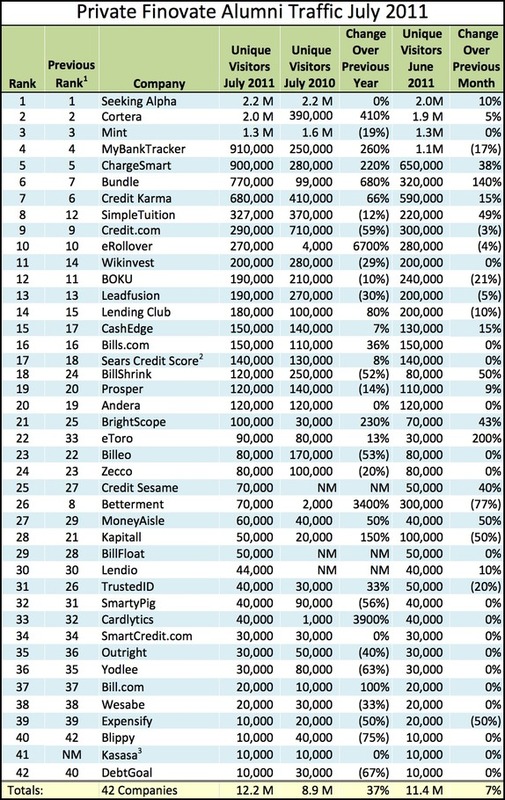 Betterment saw its traffic increase an impressive 38 times from May of last year. PayPal experienced the highest number of U.S. visitors in May, with over 32 million visitors. TransUnion Interactive saw the highest month-over-month growth with more than two times the number of visitors in May than in April. Sybase 365 experienced the highest year-over-year growth, with its traffic up almost 80% from last year. They were no longer available online. They were not covered by Compete for various reasons (including some that were not U.S. domestic companies). The number of unique visits was too small to be considered accurate. They were subdomains of larger websites. 2. Numbers have been rounded to three significant digits. 4. Compete draws its information from the online activity of a panel of more than 2 million U.S. Internet users. It is only an estimate of traffic, and may undercount at-work usage. Tyfone contracted with Star One Credit Union to use its NFC technology.